Last year's impressive Rogue-lite Adventure from the BioShock veterans at Uppercut Games, City of Brass is coming to Nintendo Switch on February 8. Inspired by Arabian knights, City of Brass tasks players with trespassing into a cursed city in search of treasure. Equipped with a handy whip and blades, players will need to navigate a mazelike metropolis, all the while avoiding deadly traps and fending off hordes of otherworldly enemies. 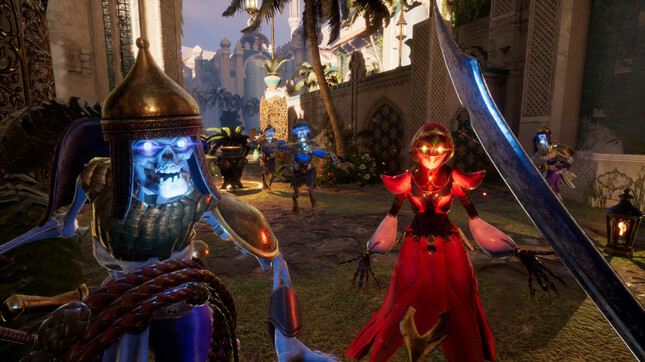 The Nintendo Switch version of City of Brass will launch with three new unlockable characters as well as additional enhancements, including new relics, weapons, enemies and other tweaks. In our review, Alan stated that "Rogue-lite fans are going to love this one and there’s enough interesting, fun, and engaging stuff in here to make it well worth a look for action fans too. It’s difficult without being ridiculously so, and the varied levels ensure replayability is high even if you can’t get very far. It’s top stuff – you should totally get it." Did you play City of Brass when it released last year or will you be checking it out for the first time on Nintendo Switch?